In the last 5 yrs, we have witnessed an unparalleled cult phenomenon with the rise of many right wing govts across the world. In india, this phenomenon is now threatening democracy itself as it has taken gigantic proportions and the people who have unleashed this have themselves no control on it. 1. Extreme ideological alignment, where a core group of population is totally enamoured by the right wing ideology, teaching, leaders, etc..
2. Huge hated and resentment against other political ideologies - liberalism, left wing, socialism, secularism, etc..
3. Most believe that the Right wing govts are on a holy crusade to right the historical blunders committed by the liberal left wingers. Hence any and all means adopted by them should be fully supported even if in some cases they indulge in corruption. 4. Remember, the right wing only indulges in corruption out of a higher cause, but the liberal left wingers indulge in corruption for personal cause. LOL. 5. Anyone opposing the right wing govt is immediately branded as anti Hindu, anti leader, etc..
6. Anyone criticising this govt is immediately drowned out by a huge litany of personal attacks, mockery, trolling, etc..
Now this has grown to the extent these right wingers are there threatening the very existence of democracy itself. And you can see in this forum, we have a huge problem in debating legitimate criticism on this govt performance or lack of it. Many right wingers are getting too emotional by these continuing criticism of their beloved govt, beloved leaders, etc..
1. First off, you are not letting us liberals freely debate and criticise this govt which is fundamental freedom of expression and central to democracy ?? No one is saying you cannot criticise us or our contents, but why troll and start personal attacks ?? 2. Second, why are you getting emotionally charged if we criticise this govt ?? I mean, seriously, if someone says, bad things about Rahul, none of us will get emotional or upset. LOL. 3. If you don't like the discussion on a particular thread, ignore it and open a separate thread to counter it !?? For eg, open a thread on this Govts performance and counter the liberals by highlighting the key achievements !! 6. Intact many of us started criticising only after the disastrous demo and GST ?? ?, so this is a legitimate criticism, so why get upset ?? 7. Finally, I hope you all realise this is extremely unhealthy both for democracy and also for your personal health ?? Anyways, in short, this cult right wing phenomenon is threatening democracy and freedom of expression in all forms of life - personal discussions, social media, Twitter, Facebook and this forum !!! Hope you all realise and allow for open debate without trolling and personal attacks. Now, please do a favour and not attack me personally, or mock me, or provoke me to get into a personal fight !! It did not happen in the past, even when Vajpayee was a taller leader !! I mean, seriously, what is this govt for you ?? Mama, Macchan, or ?? Why are you getting so worked up by posts that critiques this govt to the extent of starting personal attacks ?? Just take a look at Europe. The ruling elite have manipulated the whole population into lefty ideologies and now we are suffering from Muslim invasion in a very peaceful way. The ethnic Europeans are wiped out of their own history, culture and values. I am afraid India is the same since centuries now. The invaders and the already long term residents in Europe are already throwing their weight around and getting laws passed in their favor. The non-ethnic European residents are out breeding Europeans. The right wing narrative in India or anywhere is propagated by the media and the left wingers. India is such a chaotic mess. left wingers anywhere is the world are only name calling and bullying even if we don't have a right wing opinion. In Europe if you are a white European even with no political opinion you have no right to open your mouth or fight injustices in any aspect of the society. Do Hindus have to go on suffering atrocities even after suffering centuries of it. Media in India or anywhere in the world is controlled by the same few big firms and they are all left wingers. So in the end opinion or no opinion if you don't fit their narrative you will be labeled a right winger. This is my personal experience there is no room for debate with liberals and left wingers. Cultural Marxism in all forms. I understand your concerns and this is the same expressed in every country, evey place starting from Mumbai with outsiders, south india with North Indians, Europe with muslims, USA w Mexicans, etc.. Hence a lot of countries, cities, regions are under seige and we need to protect the locals, their traditions, culture, etc. Fair point. 1. Keep asking - "so what"
2. So what if the white culture goes away a completely in 100 yrs, and a mixed white + Muslim culture comes up. ? 3. So what if the Hindu culture gets merged into Islamic culture and a new culture comes up in 100 yrs ? The point is, so what if all locals get intermixed and old culture gives way to new ?? Yes, there is loss of the old and then we take pride in the new. All I am saying is, our larger karmic goal in life is to ensure, no human life should be lost and no mother should grieve her kids loss, in this mega war to preserve white man, white culture, white traditions. Now see the enormous human tragedy, the trump thug is stopping the "desperate migrant mother carrying her 6 months baby in her hand" at the border saying the country is full. The mother and kid has to go back 1000 kms to her homeland and in all likelihood will be dead by then. So what justice, what white culture you want to preserve on the dead bodies of this mother and child ??? At the end, which ever way you analyse, "liberalism" is the only right way forward !! How much ever I may grieve the loss of my traditions, it is far less than the grief of the mother losing her child !! After we have discussed the great white man concern, let's come to our homeland. Now, in which world, is this correct or morally justified ?? The mob suspected 68-year-old Shaukat Ali of selling beef and cornered him. They thrashed him and also proceeded to force feed him pork. The incident took place in Assam's Biswanath Chariali. How can we support such a tragedy where a 68 yr old Muslim man is trashed on the road, sitting in such desperate situation ?? If the right wingers believe in our religion, karma theory, then how can any,one support this ?, in the name of preserving Hindu culture, traditions, etc...?? Approx 70 yrs back, a group of desperate polish Jewish immigrants boarded a ship and crossed the Atlantic and landed in the USA. The great USA stopped this ship and asked them to,go back, as they didn't want their white culture polluted with Jews. In absolute desperation, they came to india, Gujarat, the local King Bikram Singh welcomed them, housed them, gave them food, etc.. for years !! Now the question in front of all of us is - do we want to follow the super great evil white man or our most noble Hindu King Bikram Singh ?? Not doing you any favour - Wait for மக்கள் தீர்ப்பு! My view has always been that there is nationwide negative sentiment due to severe joblessness and farm crisis. So these outbursts by Digvijay may not have similar impact like the last time it happened with mani shankar aiyar. In this election, we may truly see people holding the govt responsible for economic performance !! Reason being, most of the people lost their business and jobs as a direct consequence of the centres policy of demo and GST !! Hence people know whose fault it is and there is a huge negative sentiment against centre. I fight for women in every available space She was in jail for 9 years Now out on bail Today the fight is in political space Wait and see how it spans out! 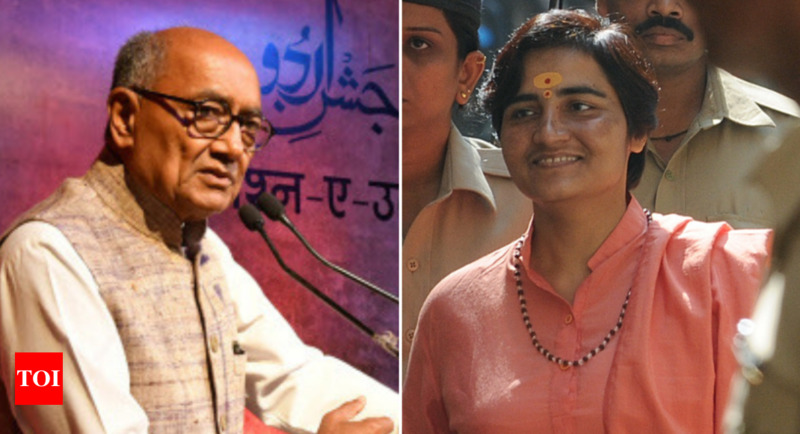 This is dharmayudh Digvijay was at her Jugulars! Jai ho Sadhvi! Not downplaying the issue of women. But this fight - dharamyuddham is much much bigger. 1. Communal Harmony. The virus of continued communal hatred, lynching, gau rakshaks, killings, due to political idoleogy threatens the very fabric of our society !! 2. Political and Media freedom - Never in history has any govt restricted media freedom to this extent, raided so openly political opponents. Once BSP and SP announced the tie up, both maya and Akhilesh associates were raided and FIRs lodged. Remember, how media went after 2g scam day in and day after ? And the Shashi Tharoor Kochi IPL issue ? That bold media is dead now !! 3. Institutional failure - evey institution has been subverted and not allowed to function independently. CBI, RBI, EC, CVC, IT, etc..
4. Individual freedom - people are scared to air their views on social media today than they were during upa2. 5. Economy - finally the biggest of them, is the mega failure of the economy. 45 yr joblessness. Imagine how many millions of people have lost jobs and their families on the path of ruin ??? If this govt continues on this misguided extreme right policies, we will surely and certainly end up as Venezuela !!! Right wing supporters need to realise, this election is not about corruption, not about ideology, not about appeasement politics. it is about the very survival of this country as this govt is on a deadly downward spiral on the economic policies, communal fabric, farm crisis, and small traders. And they are not willing to listen to any of the economists !!! In short, we went from a corrupt upa2 to a total dictatorial regime !! And the rate at which this govt is raiding only the political opponents, we will soon not have any opposition at all !! All of the opposition, will catapult and align with the govt to avoid ED and IT raids !!! In the Mahabharatam, the Dhana Veera Shourya Karnan lost his life due to his association with Shakuni !! Even King Dhuryodanan lost his way due to Shakuni. Right wingers need to understand this, don't associate with hate rhetoric and justify lynchistan, killings in the name of larger religious cause. There is none. Such hatred will in the long run ruin your own lives by making you commit mistakes and blunders !! Remember how this govt got undone by the self goals of demo and GST ?? And if you all right wingers oppose such fringe elements, then your beloved party itself will reform for the better!! Remember, this govt did not rake up the Ram Mandir Babri Majid issue as social media erupted and we are now on the right path of mediation !! Democracy will be in peril when a separate P.M demand is encouraged Only right wingers can save the country with a strong PM at the centre ! Appeasement can't!